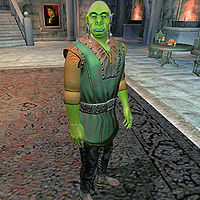 Shum gro-Yarug is the Orc butler at Castle Skingrad in Skingrad. You can talk to him during the Thieves Guild quest Lost Histories in order to obtain a job at Castle Skingrad as a slop drudge. You can also ask Shum about purchasing Rosethorn Hall in Skingrad, but he will only give you the option to buy it if his disposition to you is high enough (70+) and you are considered famous (Fame 15+). As the castle butler, Shum lives a rather uneventful life; he sleeps in a small room in the southern part of the Wine Cellar every night between 2am and 8am. After waking up, he heads down into the County Hall for two hours of wandering. At 10am he travels to the center of Skingrad and hangs out at the West Weald Inn until noon, when he enters Colovian Traders for a bit of browsing. He returns to the County Hall at 2pm and spends the rest of the day there. At midnight, he finishes the day with a late two-hour meal in the Dining Hall. He wears the rare, zero-weight forester's shirt, blacksmith's pants and a pair of green velvet shoes. He carries the key to Skingrad Castle and a large amount of gold. When you meet him for the first time, he will politely introduce himself: "Sorry. You want me? I'm Shum gro-Yarug, the Count's butler." About Skingrad, he will provide a bit of information on Count Janus Hassildor: "If it's not one thing, it's another. The Count is very particular about his food and drink. Everything must be just so." If you ask him about buying a house in Skingrad, he will reject you until his disposition is 70 or above. Also, if your fame is lower than 15, he will say: "Count Hassildor will only consider buyers of distinction. You just aren't famous enough." When you fulfill the requirements, he will be willing to sell you Rosethorn Hall: "I can speak for the Count. Rosethorn Hall is a stately manor currently occupied by Vandorallen Trebatius. You won't find a better property for sale. It's just inside the main gate, near the bridge to the chapel." After this, three options are available; if you tell him you are not ready to buy, he will dismiss you: "Somehow I knew you weren't serious about it." If you try the "25,000 gold is too much for my blood" option, he will respond with "Your blood? I wouldn't dream of paying 25,000 gold for your blood. But that is the price for that house. Take it or leave it." If you accept the price tag, the house is yours and Shum will hand you the key while promising to get rid of the current resident: "I will order the deed drawn up. Take this key. The house is just inside the gate, by the bridge to the chapel. Don't worry about Vandorallen Trebatius. I'll have him evicted. I'm sure he'll find another home easily. Oh, and don't worry, we're tossing all of his junk out as well. If you head to Colovian Traders, Gunder can provide all sorts of great furnishings for your new home. Good luck!" During the Lost Histories quest, one of the available strategies to get into the dungeons of Castle Skingrad is to talk to Shum about an underpaid job as a slop drudge. When asking about Shum to the Skingrad citizens, you will get some info on his whereabouts: "He doesn't leave Castle Skingrad often. At ten he heads over to the West Weald Inn. Then at noon he goes to the Colovian Trader." and "You mean other than at the Castle? Hmmm. He's around town at midday. Try the Colovian Trader and the West Weald Inn." When approached about the job, Shum will make you a very bad offer: "I need someone to slop food to the prisoners. I'll pay you 2 gold a week, plus half a loaf of bread and a glass of mead each day. I'm having trouble hiring these days, so if you want the job it's yours." If you reject his offer, he will be surprisingly understanding: "I'm not surprised. Nobody wants that job. Let me know if you change your mind. It will probably still be available." If you accept his offer, he will say: "You will?! I mean, good! Mind your manners in the castle. Stay out of Count Hassildor's quarters. And don't let me catch you in the wine cellar! The jail guards in the dungeon will unlock the cell block door if you ask them. Feed the prisoners once a day. I don't care when." He will send you on you way with the words: "Get back to work." He will now also greet you with: "Why aren't you working?" Apparently, he is a member of the local "Orc Social Club," at least according to the townspeople: "Shum gro-Yarug is the butler in Castle Skingrad. Who ever heard of an Orc butler. Plus, he's in that 'Orc Social Club.' What a joke." They will also comment: "I wouldn't want an Orc butler, but apparently the Count doesn't mind. Shum gro-Yarug has been there for years." Xbox 360 and PS3 users afflicted with this bug cannot fix it and will be unable to buy Rosethorn Hall. Although the problem is not common, it may be wise to deal with Shum as early as possible. Also, spending less time in Skingrad and the surrounding area reduces the chances of Shum falling off the bridge. Using multiple saves is always recommended. You could also spend your time in Skingrad during night time to avoid him falling off the bridge.